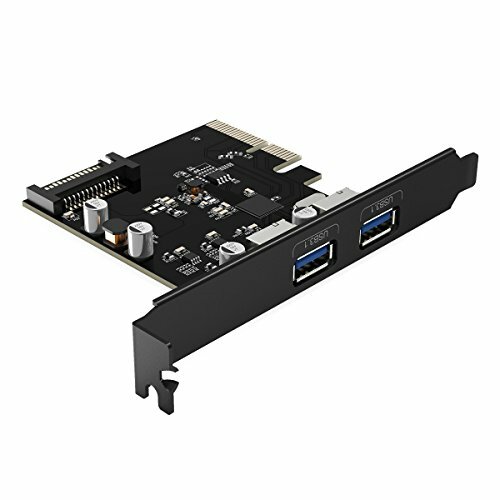 This PCI-E card is only compatible with standard-sized tower cases (not mini computers). . This PCI-E card is powered by a 15 pin SATA power connector. Please confirm that your computer power supply is equipped with a 15 pin SATA power connector plug before purchasing. This is necessary to ensure sufficient power supply and smooth transfers, particularly for large data transfers from hard drive disks . Expand 2 USB3.1 ports to connect 2 USB devices; USB3.1 is backwards compatible with USB3.0 / 2.0 / 1.1. The actual rate is up to 500 - 800 Mbps, saving much more time for you to transfer your video,music,photos,and data between USB devices and your computer. Advanced black PCB, SMT and all-solid capacitor manifest its outstanding quality. Apply to motherboard's PCI-E slot, plug and play; compatible with Windows XP/7/8/8.1/10.